34 n Performance & Hotrod Business n April 2015 PERFORMANCE use of diesel as a fuel for everyday vehicles than we do stateside. Street-legal diesel trucks were discussed regarding what can legally be done to them in order to increase power and fuel econ- omy. Many different options were offered up by the panel experts including engine components, air intake, exhaust and trans- mission options. DIESEL Motorsports' title sponsor Flowmaster offers DPF-back legal exhaust systems that enhance per- formance and fuel econ- omy, and many of our sponsors sell similar, legal performance products. The questions at the end of the discussion from the crowd were about what can be done to diesel trucks to create more efficient power and fuel economy. That seems to be the trend for shop owners heading into 2015. More to Come T h i s y e a r D I E S E L Motorsports plans to offer a seminar on the sport of sled-pulling in the Midwest. It is quite popular and spreading to events including fairs, city happenings, fundrais- ers and standalone competitions. 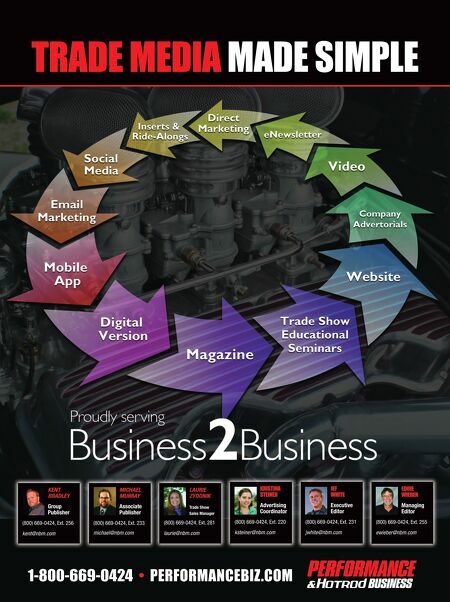 Trade shows have become a diesel draw for many shops, manufacturers and com- petitors. We do not see this changing other than growing every year with more manu- facturers offering products and services in the diesel performance market. 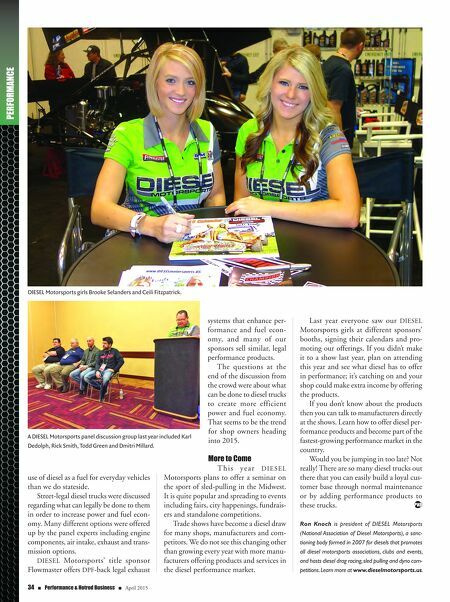 DIESEL Motorsports girls Brooke Selanders and Ceili Fitzpatrick. Last year everyone saw our DIESEL Motorsports girls at different sponsors' booths, signing their calendars and pro- moting our offerings. If you didn't make it to a show last year, plan on attending this year and see what diesel has to offer in performance; it's catching on and your shop could make extra income by offering the products. If you don't know about the products then you can talk to manufacturers directly at the shows. Learn how to offer diesel per- formance products and become part of the fastest-growing performance market in the country. Would you be jumping in too late? Not really! There are so many diesel trucks out there that you can easily build a loyal cus- tomer base through normal maintenance or by adding performance products to these trucks. Ron Knoch is president of DIESEL Motorsports (National Association of Diesel Motorsports), a sanc- tioning body formed in 2007 for diesels that promotes all diesel motorsports associations, clubs and events, and hosts diesel drag racing, sled pulling and dyno com- petitions. Learn more at www.dieselmotorsports.us. A DIESEL Motorsports panel discussion group last year included Karl Dedolph, Rick Smith, Todd Green and Dmitri Millard.